LOVE // Courtney & Michael — Love Find Co.
Mike and I met at a bar in Brisbane and locked eyes, he asked me out that night but I kept him at arm’s length initially. After a few months we ran into each other again and he didn’t let me get away that time…the rest was history. He was such a romantic with his proposal, and super well organised I might add. We were in Dubai for his week off and he took me to my favourite restaurant ‘Nobu’. I should have known something was up immediately since he let me keep ordering whatever I wanted! All the staff in the hotel and restaurant were also in on the proposal and when I finally stopped eating a butler took Mike and I up to the Presidential suite in ‘Atlantis the Palm’ so that we could see the view (little did I know this was all part of the plan) and this is where he proposed to me on the balcony overlooking Dubai. It was incredible, also very unexpected from my end as we had been on so many holidays previously before Dubai where I thought he would propose. My main source of inspiration was actually my grandparents farm where I spent a lot of my childhood. I knew I wanted a rustic feel to my wedding and once I had that idea planted then I started following many wedding focused Instagram accounts for inspiration, and of course stalked Pinterest daily. 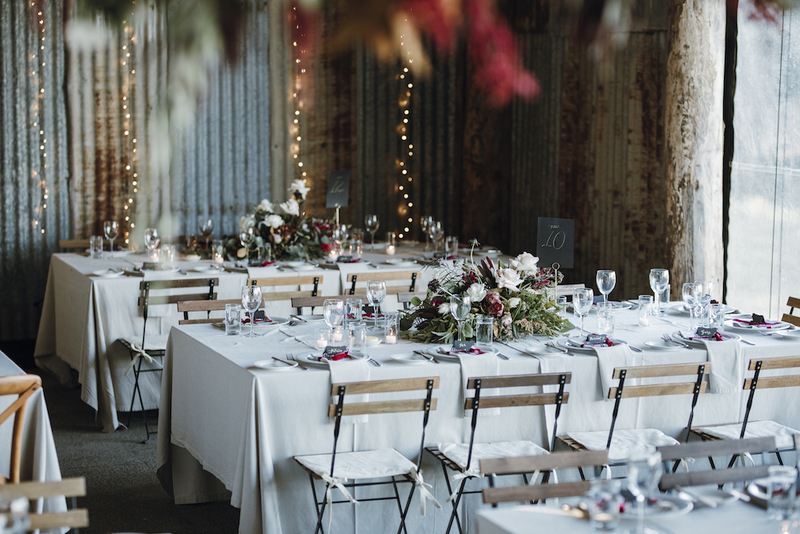 The theme and style was rustic vibes however we had modern touches hinted within our styling amongst table settings & furniture. We had an amazing wedding planner/stylist Carly from CL Weddings who also helped us integrate the two styles seamlessly. 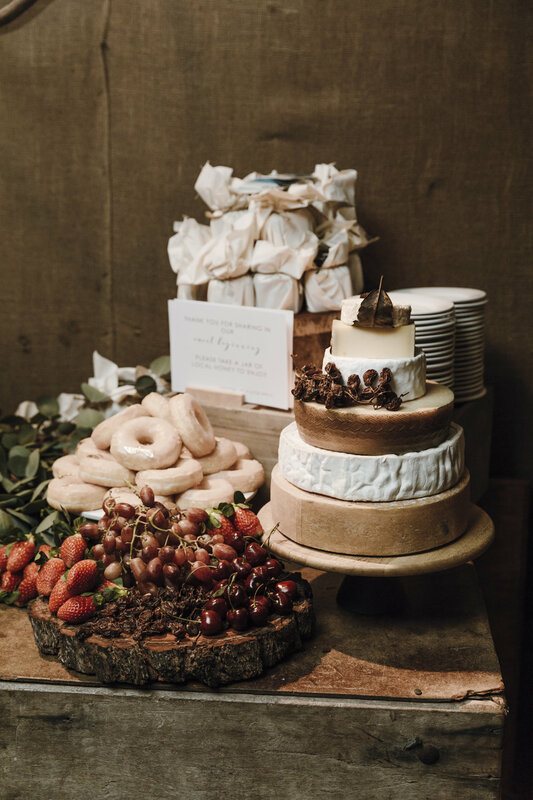 We also had a lot of French characteristics injected into our theme as our life for the past two years had been in France and that was super important for me to bring that French style into our rustic vibe, especially with the cheeses and French champagne, that was mandatory! We have lived in quite a few places and have made some lifelong friends along the way. Most of these people came from so far to see us tie the knot and it was so important to us that all our friends from around the globe got to meet each other and our families finally. For me also, my grandmother was a huge part of the planning process in my wedding. My Mum, Nanny and I used to talk about all things wedding, each week, 18 months prior. Sadly she passed away just weeks shy of the wedding day which was incredibly tough for my family and I so the wedding was very personal for me in that respect as she was very much apart of that day still. I was most nervous about walking down the aisle on the grass in super slim high heels. My Dad helped me out big time with this and held me upright as I walked down the aisle haha. All the nerves started in the car ride to the venue! I was most excited about seeing all my family and friends after the ceremony and actually chatting to my husband about how his day had started and how he was feeling! My dress was the ultimate dream dress for me! I was living in France when I started the process of finding a dress. I scoured Paris but couldn’t find anything I loved. I eventually came across George as he had designed a dress for my friend months earlier and I knew that his particular style was all aspects of what I thought might dress should be. He was incredible with long distance planning with me and I had so much confidence in him. There was not one point of uncertainty with George. I certainly had some crazy ideas that he really helped me work through to make a reality, ensuring I was always happy and excited every time I left his showroom. The dress itself was a hand-beaded lace that covered my bust, torso and hip areas. It was tight fitting and the tulle skirt gracefully fell from the hip down. The top of the dress was beaded lace that was off the shoulder. The lace floated on my shoulders and then carried over to a low back. My grandma who was with me for the entirety of the dress planning process, until a few weeks before the wedding chose the lace with me & pointed out a feature of it that actually resembled a silver fern (my husband is from New Zealand) on the front of my wedding dress. Zimmerman. The colours for that season were the perfect match to my wedding colour palette! MJ Bale. We had Mike in France, and each of his groomsmen living in Japan, New Zealand and Thailand in the lead up to the wedding (logistically a nightmare for suit planning) and they along with MOG helped tremendously. Yes! I had so much fun with this part. My family and I were at our grandparent’s farm and found some dead trees and thought well why don’t we make our own cheese boards for our dessert table! My uncle whose handiwork was much needed cut perfect circular boards that we polished up and used on the night. They were a huge hit! We also used homemade honey by another family member for our dessert table and as a take home gift for guests. Standing under the beautiful fig tree that was covered in stunning flowers by Terrianne from Mondo Floral. Mike and I were holding hands the moment before our ceremony started and just looked at each other, and then the whole day began. That was so special for me. To have trust in one another and become a ‘team’. We have been together for 7 years so not a lot has changed but it is about the next stage of life for us where we can begin our next chapter, whether that be family next or another country to live in and explore. The most important is that we are doing it together, forever! Something New? My beautiful dress and also my sparkly Stuart Weitzman shoes. Something Old? Some pearls that were my Mums, we had them revamped into earrings, a necklace and bracelet. In the end I wore the earrings and bracelet. ANY WORDS OF WISOM YOU CAN PASS ONTO FUTURE BRIDES & GROOMS? The ‘post wedding downs’ are real!! I had such an incredible night and so did all my guests and everyone said to me they wish they could relive the night as everyone had so much fun. I kept saying to my husband ‘can we did it all again’, so it’s definitely sad when it all ends. The day goes so fast so you really need to be in the moment and appreciate all the planning that you invested into this one day. I really cannot stress enough to any future brides, make sure you take a step back on the night with your husband and look around the room at all the people who have come to celebrate with you. Look around at what you’ve spent months creating…and then get back to the party!